for Children with Cancer, Inc. 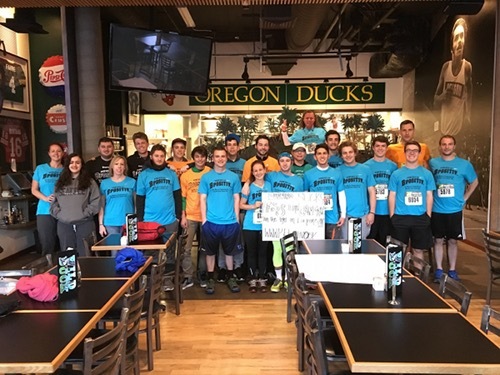 The 2019 Eugene Marathon is coming April 28th, 2019. We would like to thank all of our sponsors and donors for their support in the local fight against childhood cancer in Oregon. Look for our jerseys on the course on race day and come cheer our team. There is still time to donate and make a difference to the families we serve. For more Powered by Bpositiv race date information, please contact Daniel Pite, executive director: 541-390-7684. If you would like to run for Powered by Bpositiv, register for the race at EugeneMarathon.com and make sure to put yourself on Team Powered by Bpositiv on your race application. It is a mission of the Bpositiv Foundation for Children with Cancer, Inc. to offer informational, educational and emotional support to the Oregon families of childhood cancer who will receive a diagnosis for their child which is terminal in nature. We will also offer (when available) limited financial support for "end of life" services and other needs through a simple application process which will be available to those Oregon families facing these circumstances. We work directly with the Doernbecher Children's Hospital Social workers. The Bpositiv Foundation for Children with Cancer, Inc. is a registered 501(c)3 organization. If you would like to contribute to the Bpositiv Foundation for Children with Cancer, Inc., you can donate through PayPal. All donations will be deposited into a Bank of the Cascades account for the Bpositiv Foundation for Children with Cancer, Inc. – a 501(c)(3) nonprofit organization.